Two months ago, two members of the Volusia County Florida Teenage Republicans had a wild idea. They decided to create an official vehicle for their TAR Chapter. At first this might sound like a dumb idea, but if the rise of Donald Trump shows us anything it’s that people are tired of the political status-quo… they want something bold! That is why Duncan DeMarsh and Malcolm Swaggerty from DeLand, Florida, chose to turn Malcolm’s 1998 Dodge truck into their club’s official vehicle. With a budget of less than $25, the two set out with the mission of creating a new form of “Grassroots” activism. By using the wood from the scrap pile at Home Depot, old paint, and a lot of good ole fashioned American ingenuity the VCTARs were able to build their own unique platform for spreading their message around town. Since it’s construction, The TARS truck is a familiar sight around Volusia County Florida. Equipped with its own Instagram and twitter (@TARSTRUCK), the Volusia TARS have taken their truck to many schools in the county as a fun way to register teens to vote. 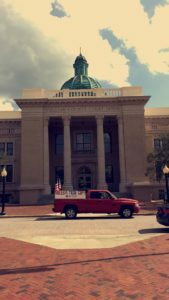 The TAR Truck was also featured in the Lake Helen Florida 4th of July parade in which she was used as a platform to hand out more than 500 pocket Constitutions! Due to the ingenuity and hard work of the Volusia County Teenage Republicans they now have a fantastic mobile platform to promote Liberty and Conservative values to their peers! Duncan DeMarsh is the Club Chairman of the Volusia County TARS and Vice Chairman of the Florida Federation of Teenage Republicans.